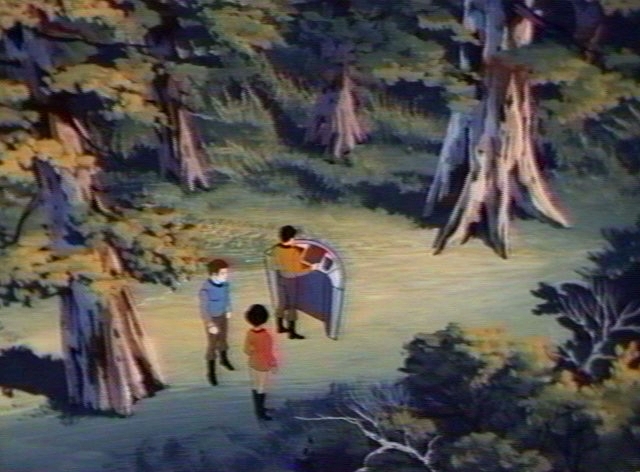 Animated STAR TREK - "The Practical Joker"
PSA epilogue for "The Practical Joker"
The voice of the animated Enterprise's computer, which behaved erratically in this episode, was provided by Majel Barrett. She also voiced the main computer in the original series, STAR TREK: The Next Generation, STAR TREK: Deep Space Nine and STAR TREK: Voyager. 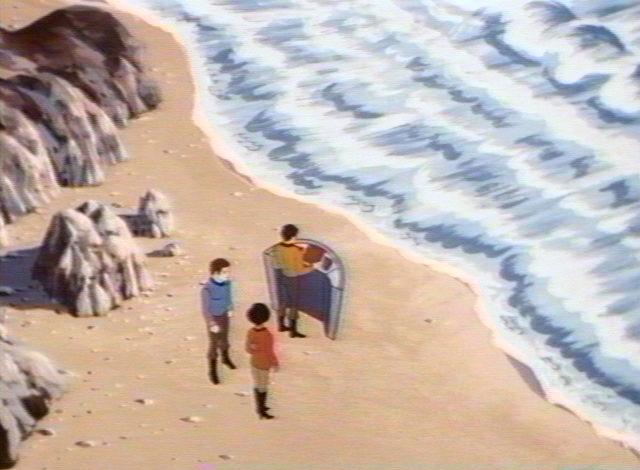 This 19th episode marked the last animated show that Majel Barrett provided voices for. Nichelle Nichols provided all of the female voices in the remaining three episodes. This episode's story was quite similar to the seventh-season STAR TREK: The Next Generation episode "Emergence." In "Emergence", the U.S.S. Enterprise-D passed through a magnescopic storm, this caused the ship's computer to briefly exhibit an emergent intelligence. Coincidentally, the computer in that episode even made use of the holodeck to act out some of the facets of its new personality, and Troi, Worf and Data were trapped and endangered there for a time. Recall that in "The Practical Joker" the U.S.S. Enterprise computer trapped Uhura, Sulu and McCoy in the holographic Recreation Room and subjected them to dangerous weather and other pitfalls. As in such original series episodes as "Is There in Truth No Beauty?" 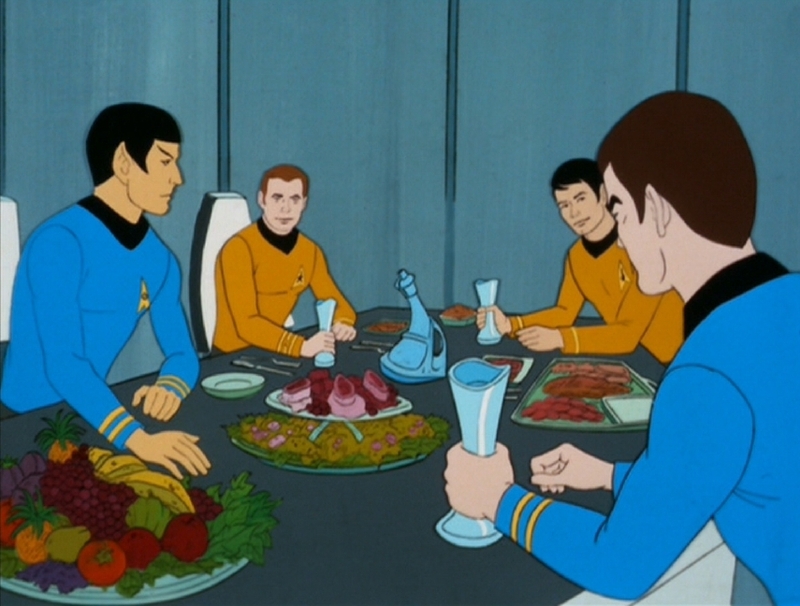 and "Space Seed" the senior staff are seen dining together in the ship's Mess Hall in this episode. 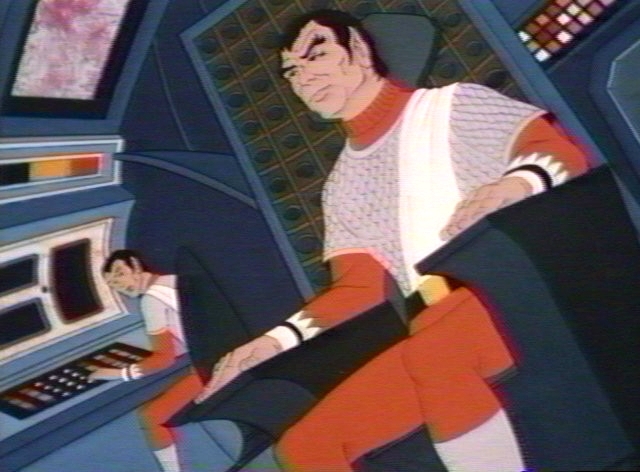 Series producers and Filmation Associates co-founders Lou Scheimer and Norm Prescott took the opportunity to provide voices for the two Romulan characters in this episode. Lou Scheimer (pictured left) voiced a number of characters in the many animated series Filmation produced including Bat-mite in The New Adventures of Batman, N'Kima in Tarzan, Orko in He-Man, and characters in She-Ra, Ghost Busters, Fat Albert and The New Adventures of Gilligan. His son and daughter, Lane and Erica, also performed many voice roles in such shows as The Brady Kids, My Favorite Martians, Lassie's Recue Rangers, Mission Magic and She-Ra. Norm Prescott (pictured right) seldom did voices, with STAR TREK and The New Adventures of Mighty Mouse being the rare exceptions. In this episode as in "The Survivor," the ever pragmatic Romulans demonstrate their preference to only engage Federation starships with tactical groups of two or more battle cruisers. There is a page in this site devoted to the Romulan Ships that were featured prominently in this episode. The director credit associated with this episode was Hal Sutherland on the episodes as originally aired on television in the 1970's, 1980's and 1990's and as released on video tape and laserdisc. However, the DVD release of the animated series in 2006 changed the opening credits to indicate that Bill Reed was the director of this episode. In fact the credits of "The Pirates of Orion", "Bem" and "Albatross" were similarly modified to list Bill Reed as director. Up until November 2006, it was generally believed that Bill Reed only directed the final two episodes, but in fact he directed the final six. In an exciting sequence that would have been cost-prohibitive in live action, the practical-joking computer briefly cuts off the artificial gravity sending the crew floating about. "The Practical Joker" was novelized by Alan Dean Foster in Star Trek Log Six published by Ballantine Books in March 1976. 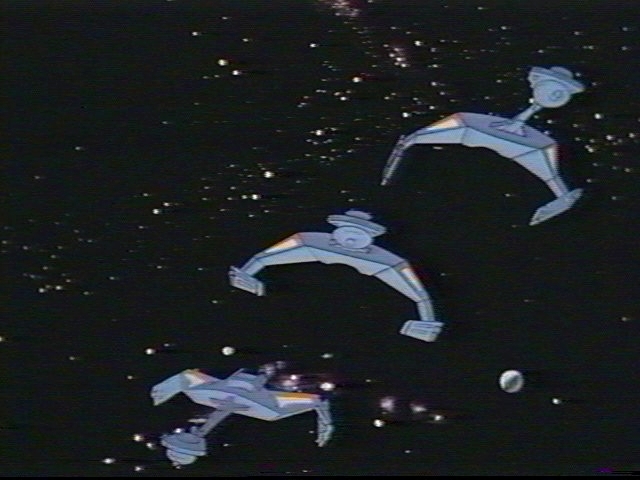 In Alan Dean Foster's tale, the inflatible ship created by the practical-joking ship's computer was a Dreadnought, not a large version of the Enterprise as in the aired episode. Also novelized in the book was "Albatross" and "How Sharper Than a Serpent's Tooth".